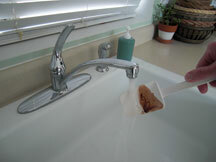 Place a hot pad on the counter on which you will place the hot fudge bowl. 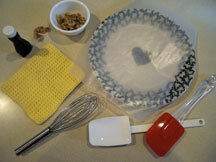 Ready marshmallow creme or mini-marshmallows, vanilla and nuts if you'll be adding them. 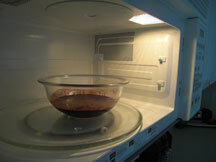 Once cooked, remove bowl from microwave and set on pot holder. Add marshmallow and vanilla. 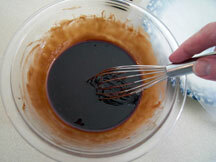 Using your whisk (or spatula if desired), carefully stir fudge (it's HOT), mixing in the marshmallow thoroughly. 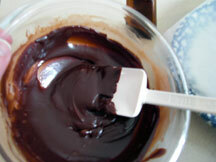 You will be stirring the fudge for 4 or 5 minutes or longer before fudge is ready to pour. 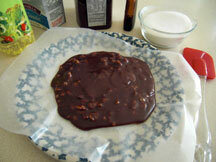 Don't let the mixture sit without stirring for more than 15 seconds, or the fudge may be gritty. When fudge is close to being ready to pour, use your spatula to stir (you'll need it to scrape out the bowl) and add the nuts if you'll be using them. 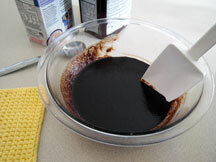 Knowing when to pour fudge is a bit tricky, but when mixture begins to look like thick frosting, begins to look less glossy and looks a little lighter in color (very subtle), it's probably ready to pour. 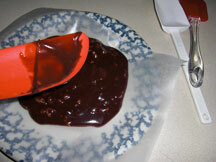 Pour fudge unto wax paper, it should set up quickly.